How much does it cost to travel to Surfers Paradise? How much money will you need in Surfers Paradise? AU$128 ($91) is the average daily price for traveling in Surfers Paradise. The average price of food for one day is AU$32 ($23). The average price of a hotel for a couple is AU$163 ($117). Additional pricing is in the table below. These average travel prices have been collected from other travelers to help you plan your own travel budget. How expensive is Surfers Paradise? How much money do I need for Surfers Paradise? 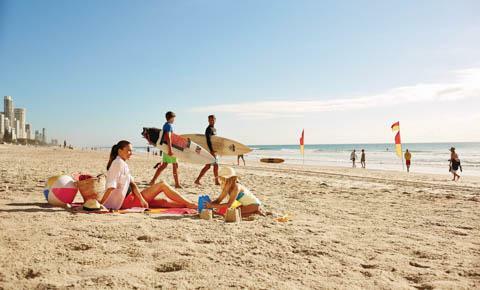 A tourist mecca, Surfers Paradise is one of the most popular travel destinations along Australia's famed Gold Coast. The beach stretches for miles and there is an endless supply of almost constant parties. You'll find high rise apartments lined up along the shore and plenty of shopping areas, restaurants, nightclubs, and bars. Travelers from around the world visit the area, and it's a right of passage for Australia's teens to vacation in or near Surfers Paradise. For many travelers, Surfers Paradise comes across as little more than a mass marketed, over commercialized, party destination, but for others it is a vacation dream. Prices are highly inflated so you have to keep your whits about you to avoid being ripped off. Surfers Paradise is a destination of extremes and it conjures up extreme emotions in many travelers, be it positive or negative. If you're going to Surfers Paradise to swim or sit in the sun then the best time to visit is sometime between October or March, when the weather is at its warmest. Even if you don't mind the crowds, it's still best to avoid the time between mid November and early December, known as "Schoolies", when thousands of teenagers flock to the area to celebrate the end of high school. Surfers Paradise has many amusement parks, wildlife parks, and other destinations in the nearby vicinity. Adrenaline Park is a small park that has rides and a mini-golf course. Centro Surfers Paradise Shopping Centre is located on Cavill Avenue. It's a high-end retail area with many popular shops. If you're hoping to stay in town, then you can visit the tallest building in Australia. Q1 is located right on the waterfront and climbs 323 meters high. It's also the highest residential tower in the world. Surfers Paradise Foreshore is a revitalized public space that is along Surfers Paradise Beach and the Pacific Ocean. The area has contemporary coastal streetscaping and natural vegetation. This is where many of the city's public events are hosted. The Gold Coast Nightlife Precinct has the most night time activities. This area is considered Australia's nightlife capital and there are almost 20,000 visitors daily. This area is also at the heart of the city's Schoolies week. Hotels and hostels are lined all along the coast. There are many apartments and high rise hotels that can be pricey, but there are also plenty of backpacker hostels. It's best to make reservations in advance if you plan to visit during a busy time. Sticking with the theme of crazy tourism, Surfers Paradise has no shortage of theme parks, water parks, and wildlife parks. There are countless places willing to help you part with your money for some extreme thrills. You can, of course, try your hand at surfing, diving, snorkeling, or windsurfing, among other things. The city also hosts a variety of free events throughout the year. Surfers Paradise Festival is one of the more popular events. It takes place in March or April and offers local music, food, fashion, film, and art. It's a fun time to visit the city. If you're traveling as a family, check out this great guide to the Gold Coast for families. There are plenty of places around Surfers Paradise that offer cheap eats. These options are usually low on quality but quite affordable. Most budget restaurants specifically target the budget backpacker. For high end dining options your best bet may be in a hotel. Many of the hotels have all you can eat seafood buffets which are good and filling. Lunch specials or early bird deals are also available. If you're looking for a nightclub, of course there are plenty, but you'll find the highest concentration along Orchid Avenue just off the main strip of Cavil Avenue. Surfers Paradise is a compact area and it's possible to walk to most destinations including hotels, hostels, Cavill Mall, and the beaches. Parking can be difficult to find close to the center of town so walking is generally recommended if possible. There are bus lines that provide public bus service throughout the Gold Coast area. There are several bus routes in town that connect the suburbs with the city center. There is also the GoldLinQ light rail system which has five stations around town. Taxis are also an option but the prices can be very high.